Rightwing Rumblings: Women in Hindu Dharma . Part IV . Daughter is same as Son. Women in Hindu Dharma . Part IV . 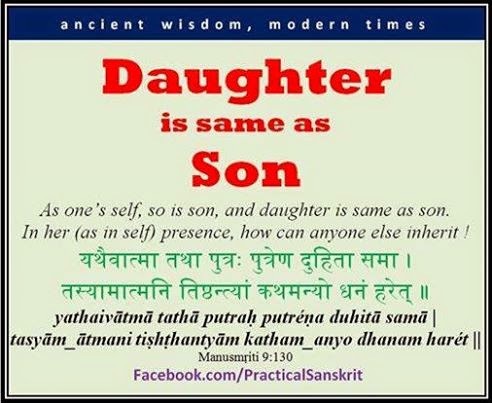 Daughter is same as Son. Who is to blame for such a rising tide of Male chauvinism and Feminism in modern India ? The answer is simple, partly its MOTHER. Iam not cleverly passing the blame on Woman (mother) . Don’t you guyz think discrimination of women starts before the birth of Girl child , almost at Womb ? How many Mothers have discarded Girl child with abortion , for their Love for Male child . May be mother does it under compulsion from Husband or In-Laws, but with such disease in mind how gender equality is possible??? My request to all the Mothers (and yet to be Mothers) is do not discriminate Son and Daughter at home. Teach your son to respect his sister in general and Women in particular. Do not pamper your son to such an extent that he keeps thinking himself as “Prince" . Never side with your Son when they fight, be neutral. Never make your daughter to do your sons work at home. Tell him to do it all by himself . Make your son to do house hold chores, otherwise he feels that all the kitchen work is only for Women. Teach him how to cook, this way he will understand hardships of cooking, otherwise he will feel its just a 30 min’s playful work. Moreover its Important to learn, once he married, he can be helpful to his wife as well . Most important thing is discuss his academics, sports and politics( if he is interested) with him, coz, these are considered as General Knowledge. Don’t send him to his Daddy Dear when he has doubts over those topics. If so , he feels that Daddy is intelligent and Mummy is Dumb and his Sister Dumbest. So, Mothers update your IQ skills. Let the Boy know that his Mother too is an “Knowledge Bank “ and thus Intelligent. When its for some sort of “decision making”, get yourself involved. Even if which movie to go or which location to move for vacation , just don’t leave it to his daddy . Again the danger of him assuming that Women are not part of decision making is high and presumes that only Men have to decide and make woman follow . Lastly , teach him all about Hindu culture and role of women in ancient Hindu Dharma . Iam an Agnostic , I don’t believe in GOD , still I suggest you to take him to Temples and Historical places to make him understand the rich heritage he is born into . Show him/her the picture of Durga Mata with ten hands all decorated with lethal arms , make him understand that women in olden days were warriors and used arms to safeguard Dharma. Tell him the stories of Jhansi ki Rani and her dare to fight for the country. Let him learn at younger age that Mother is ON PAR with Daddy on all the issues . If Daddy is ‘Super Man’ so do is Mummy a ‘Super Woman’. On Dussehra do not defoliate Shammi tree.